Summer is my time to be outside and adventuring at all possible times. With that comes a lot of eating out. I was lucky to have the Food Cart Fest just down the street from my place all summer, and I also got to explore a number of new restaurants that are vegan friendly. In no particular order, here’s where I went and what I thought! 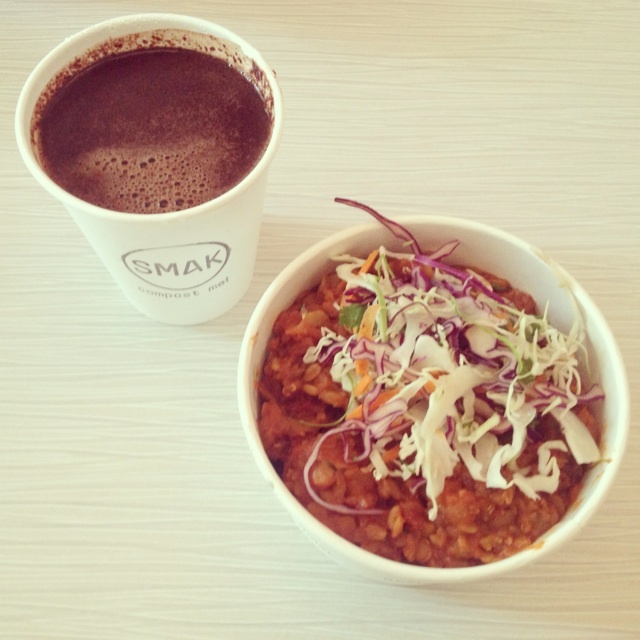 Healthy fast food to go – an under represented market in Vancouver! These guys offer quite a few vegan dishes, and they source locally as much as possible and recycle everything (which is good, because everything is made to go). The downtown Dalh is one of my favourites. They also get extra points from me for having a vegan and sugar free hot chocolate made from raw cacao that is delicious! This will definitely satisfy any craving I have for a fancy hot drink in the coming fall and winter months. This may be a dangerous place for me because it’s so close to my office haha. This is a new German sausage place in Chinatown that offers a vegan alternative! They’re looking at making their own vegan product, but right now their curry wurst sausage is by Field Roast (awesome company, great tasting sausages). It’s a fun place, just opened up early summer, and open super late for those late night food cravings. I love the way they serve it too – a small metal fork and on a plate that looks like a paper hot dog wrapper. So cute. If you have not heard of this underground food market, google it. It’s local start up food companies that get together for an evening of enjoying eating, drinking and music. The vendors change each time, but there is almost always something vegan. 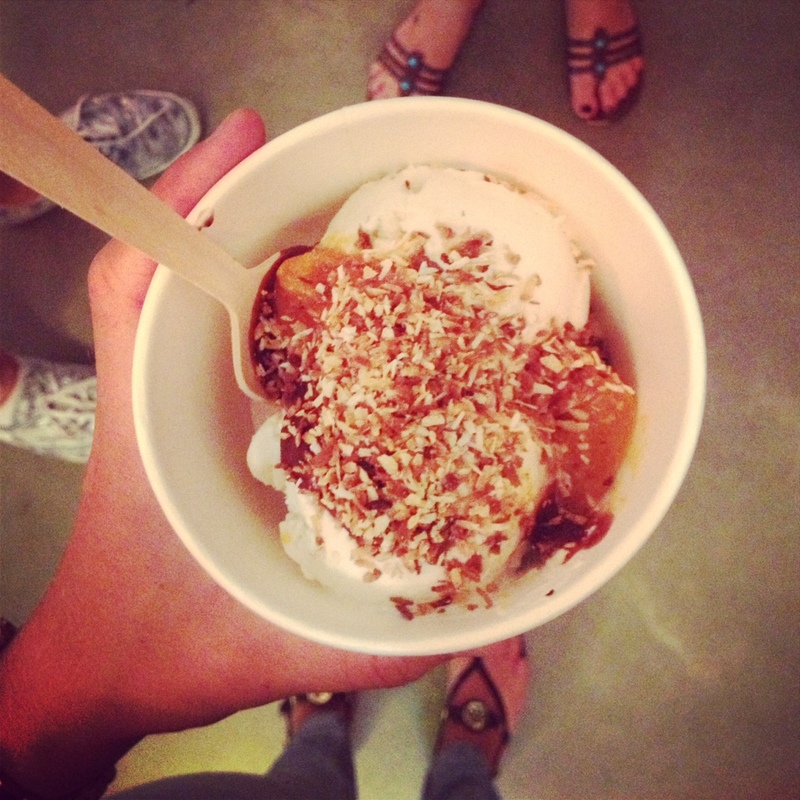 For example, the adult sundae bar by Brown Paper Packages Ice Cream has a vegan coconut ice cream. I added a bunch of gourmet toppings and had to restrain myself from getting a second one! Yummus is often there with a creative hummus dish, and the wonton girl has vegan options too. These guys have a vegan and a vegetarian pie! Sometimes I’m just in the mood for something that seems like it might not be good for me, and pastry generally gets lumped in that category. I’m sure the lentils balance it out? haha. It’s a good, hearty treat. The vegan one is also gluten free – and it still has a flaky deliciousness! What more could I ask for? How could I not love these guys?! Fresh made smoothies, juices and raw snacks. Their recipes are creative. I walked to Gastown may times to enjoy one of their creations. I do wish their produce was organic though. How have I not been here yet!? They just added vegan, gluten free muffins to the list of the things they sell AND they deliver! The owner of this cafe spoke at Pecha Kucha the other night, and it looks like they have vegan items on their menu (although it’s not listed as such). I want to try them out because 100% of the cost of the food goes to supporting Project Limelight, a charitable organization that helps kids on the downtown east side. What a great concept – eat and help kids! Where’s your favourite vegan restaurant?